Get ready to wave those Union Jack flags as the BBC announces the return of the pop-up digital radio service to celebrate the best of the Eurovision Song Contest 2015 and complement programming of the annual singing competition on BBC Radio 2 and TV networks BBC One and BBC Three. The digital radio pop-up service, which launched for the first time last year, will offer Eurovision fans the most comprehensive coverage of the song contest to date, kicking off on Thursday 21 May through to Sunday 24 May with a mix of live shows, interviews and musical treats in the 60th anniversary year of the famous competition. 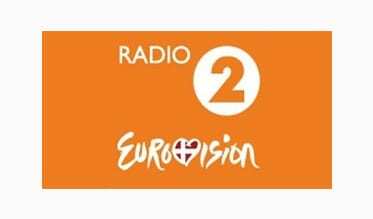 Radio 2 Eurovision will air from midday Thursday and Friday and 10am across the weekend until midnight each day over the four-day transmission. On the day of the final on Saturday 23 May, two shows will be simulcast with Radio 2. BBC One Eurovision host Graham Norton’s morning programme will air on both networks between 10am and 1pm bringing the nation all the buzz and build-up to the evening’s main event live from this year’s host city, Vienna. Then from 8pm the Eurovision Song Contest 2015 goes live, bringing fans all the action from the Austrian capital as the singing spectacular gets underway. Led by Brett Spencer (Editor, Digital, Popular Music) and Helen Thomas (Editor, Radio 2), the pop-up service will feature shows hosted by Scissor Sisters star Ana Matronic, Paddy O’Connell, Scott Mills, Sara Cox, Ken Bruce, Steve Wright, Maria McErlane, Tony Blackburn, Sonia, Rufus Hound, Vanessa Feltz and Sir Terry Wogan. Listeners can tune-in to Radio 2 Eurovision from Thursday 21 May on their digital radio, by visiting bbc.co.uk/eurovision, and listening via the BBC iPlayer Radio App and UK Radio Player. Follow @R2Eurovision on Twitter for the latest news and photos from Vienna and all the action and reaction from the contest. The first of Radio 2’s pop-up digital radio service was last year’s Eurovision pop-up which led to a jump in digital radio sales (by 7 per cent) ahead of the launch last May. This success led to the launch of Radio 2 Country, which went live in March to coincide with C2C Country to Country Festival 2015 at London’s O2.